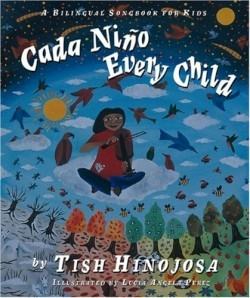 This is one of the eleven lively songs in Cada NiÃ³ / Every Child, a new bilingual songbook by the well-known singer and performer Tish Hinojosa, who grew up in San Antonio, Texas, and has presented her own songs—based on traditional, folk, and pop Mexican music—all over the world. The collection, written especially for children, is profusely illustrated by Lucia Angela Perez, with a jazzy picture on the cover. Perez, although studio-trained, paints with an almost unimaginable range of colors in a style that has all the vitality of the best of a growing school of “outsider” art. Their joint venture, plus the admirable effort of Cinco Puntos Press and a grant from the National Endowment of the Arts, has produced a publisher’s dream book at an affordable price. The lyrics are presented in both Spanish and English, and music scores are provided, keyed with chords for both guitar and piano. The songs beg for rendition, are easy to play and easy to sing, and should be a delight for children, both visually and rhythmically, and an inspiration for teachers. If there is an element that might benefit from further work, it is the bilingual presentation, always a problem with rhymed verse. The differences in meter and syntax between Spanish and English create a difficulty in translation, making it impossible to present the translation word for word. However, a summary at the end of each song makes it clear that the overall meaning and the rhythmic match of words to music are preserved in both languages. With the growing prevalence of bilingual programs in schools across the country, what better introduction can a child have to the joys of adopting another language than music? Language, when wedded to music, is dance, is flying, is the key to a common understanding and a shared emotional life. The tenderness of Siempre Abuelita / Always Grandma is illustrated with a painting of museum quality. Expect a Caldecott Award when this book is widely distributed, which it most certainly will be.